When we envision our waters breaking it's usually one of huge gushes on the kitchen floor ensued by a mass panic to scramble the hospital bags in the car because an arrival was imminent. 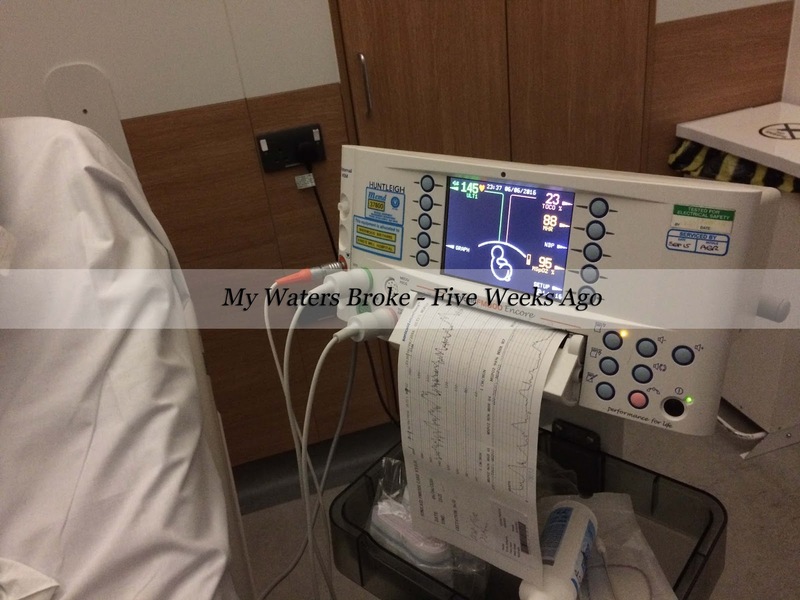 But what happens when your waters break a whole 11 weeks early? When the doctors ignore your concerns and you're rushed off home to continue into pregnancy. I even doubted myself. Had my waters gone or was this another side affect of pregnancy? Was I already losing full bladder control at the age of 23? I swear my story is like something you read in one of those 'real life' magazines. Casting myself back to a 29 week pregnant me, convinced I would be overdue like I had with my first son and happily bobbing along in a pregnancy whirlwind. It was a Thursday night and I woke up to a bizarre sensation, 'oh god' I thought, 'I'm peeing myself'. I clambered over John and out of the bed, towards to toilet and it still hadn't stopped. How on earth had I lost all control over my bladder, over night? Although I can assure you this was the first time anything like this happened, being seven years deep in a relationship and our second pregnancy, John kindly changed the bedding, taunted me a little and we rested our heads once again. For the next four hours before my alarm I think I visited the toilet six times, a mixture of convincing myself I needed to wee and being so frightened if I didn't go that the same thing would happen again which if I'm honest I really didn't want to wash two loads of bedding that night. I went to work as usual the next day and packed a couple of spare underwear and pads in my bag as I was suffering with a cough at the time, whenever I coughed - yeah you guessed it - I 'peed'. I got through work ok and even managed the Saturday fine at home, though by evening I had become concerned that I was soaking pads within an hour or so. No matter how bad incontinence could be surely it couldn't go from zero to a hundred this quick, we needed to visit the maternity triage. We called and they told us to come in, I explained to them and then they explained to me that the likelihood is this wasn't anything to be concerned about. I'd had a previous normal and uncomplicated pregnancy, no family history of preterm labour, and no pains as of yet, everything was absolutely fine. I was instructed to take my bottoms off and sit legs crossed with a bed mat under me for up to an hour, that way if there was any fluid it would 'pool' inside me and some would leak onto the mat. Fast forward nearly two hours later the mat was completely soaked and I was faced with a joyful internal by a consultant I detested from my hospital stay with Noah. She shrugs me off, making me feel quite silly, 'It's just urine, you're fine, these things happen, go home'. So we did just that. Ignoring everything my body told me for the next five weeks. 34 weeks pregnant on Monday the 23rd of May, it was time for my next growth scan, Noah was a large baby so I had already had a scan at 28 weeks to check Patrick, of course he was becoming a bloater like his brother but everything was a-ok at that check up. I presumed this would follow the same course but immediately knew after being in the scan room for 30 minutes that something wasn't right. I've had enough of these to know that the queue outside in the waiting room is growing so they don't like to mess around. Nothing was said to alarm me, so we did as usual and then waited for my consultant appointment. He took one look at the scan notes and exclaimed '2.5!! Have you leaked any fluids?' Immediately all sense of calm diminished from me as this consultant was 99% of the time so laid back he was almost horizontal, to see such a reaction was a shock. I explained the situation above and he was both infuriated and worried - at 34 weeks gestation a baby should have a minimum of 7cm of amniotic fluid, a baby the size of Patrick at the time would be nearer to 10. He quickly signed off for some antibiotics, booked my in for steroid injections the following week and instructed me that I wouldn't be carrying this baby to term, thankfully he still had some fluids remaining so I could hold on till 36 weeks when I would be induced. I don't know what ran through my mind at that point, I wasn't even officially on maternity leave yet and I was petrified of what might happen in the next 14 days before I was due to give birth. Would my baby lose all fluids? Would they find a heartbeat on induction day? Would I even be able to give birth 'naturally'? Thankfully, Patrick was born kicking and screaming though he was quite a poorly baby and spent some time in intensive care. Reflecting on the experience I feel so frustrated with the hospital, amniotic fluid decreases throughout your pregnancy so the stark reality is if I carried Patrick to term, trusting their opinion everything was ok, I'd have birthed a still born baby. It's harrowing. It's also incredibly unsettling for future pregnancies now, I'd without a shadow of a doubt be high risk, as what happened to me is called 'pprom' aka. Preterm, premature rupture of membranes and the chances of it happened again are incredibly likely. I can't really guess what caused it or why it happened, it wasn't a strenuous day, I was sleeping at the time. I do blame it somewhat on my d&c after Noahs birth, which I blogged about 3 years ago. Sending so much love to you, this sounds like it was very scary for you. So glad your little boy was ok.
Oh my! Sending over some big hugs, this sounds like a terrifying and frustrating thing to have to deal with. The NHS is an amazing service and I 100% back it and thing the staff are amazing, however I too have experienced some maternity nurses who just refuse to listen to you. They are the "experts", what would YOU know about your body, eh? I'm so sorry to hear it will likely effect any future pregnancies you have, but I'm so glad it was all picked up on the scan and you were able to give birth and things are better now. Oh my goodness, Patrick had a guardian angel with him! How didn't the first doc notice :o oh my, thank goodness he was okay! Here in Finland, midwifes & doctors take tests if there's any 'clear' unnormal fluids, it's odd that they didn't do the test for you. That would have told it! Gosh that must've been so scary! So glad both you and your little boy were ok! How scary! Disgusting that the doctors just fobbed you off. Glad all ended ok!